At the time the game was all square at 1-1, Robert Leaning netting to give the visitors the lead before a strike from Jim Burnside levelled matters. Now in second are last season’s champions Flitwick Town who retained their unbeaten record by winning 3-2 at Ickwell & Old Warden. Daniel Stafford scored a brace with a strike from Ritchie Bevan shooting them 3-0 ahead before the home side staged a recovery with goals from Lee Threadgold and Marko Tobdzic. Just a point behind them in third are Wootton Blue Cross who ran out 3-2 winners at Stevington. Dale Armitage, Valentino Qoku and Aaron Wilson scored for the Blue Cross against home replies via William Pinney and Kieran Souter. Also moving up the standings are Crawley Green Reserves and Caldecote. The Green are now in fourth after a lone goal from Sam Peverall took them to a 1-0 home win over AFC Oakley M&DH. Caldecote were 3-2 winners at Marston Shelton Rovers to sit just goal difference behind them in fifth. Jordan Platt, Dan Fennell and Tom Wallace were on their scoresheet against Rovers replies via Xennon Paul and Aaron Franks. These victories saw AFC Kempston Town & Bedford College drop from second to sixth after suffering a 3-2 home defeat at the hands of Kempston Rovers Development. Perry Ronayne and Dan Mattin were on the home scoresheet whilst Frank Junior, Bradley Stow and Anas Bechkoum netted for the Rovers. Elsewhere there was a first win of the season for Renhold United with a 1-0 home victory over bottom of the table Queens Park Crescents thanks to a goal from Alex Liburd. Sharnbrook and Cranfield United shared the spoils in a 1-1 draw, Ali Smith from the penalty spot on the hour mark shooting United ahead until a bullet header from Ross Emberton 10 minutes later ensured the home side would gain a share of the points come the final whistle. Sandy remain on top of the pile in Division One supported by O’Neills after running out 8-0 home winners over bottom of the table Cople & Bedford SA. Matt Johnson scored a hat-trick and was joined on the Sandy scoresheet with strikes from Dan Whitten, Tom Hunt, Charlie Richardson, David Smith and Harry Chinn. Still in second, just goal difference in arrears but having played a game less, are AFC Kempston Town & Bedford College Reserves who retained their 100% record with a 5-2 win at Lea Sports PSG. Charlie Corcoran and Keegan Roberts both scored twice alongside a single strike from Jake Duxbury to bring up the nap hand against home replies via Will Tyler and Joe Hennem. Now in third are Wixams who, thanks to a goal from Dale Goldie, were 1-0 winners at the previously unbeaten Riseley Sports. Just goal difference behind them in fourth place are Flitwick Town Reserves who were 3-2 home winners Shefford Town & Campton Reserves - Sean O’Donnell with a brace plus a single strike from Josh Arthur-Kent the home marksmen against visiting replies from Andrew Hayday and Sam King. However, the biggest winners of the day were Totternhoe Reserves who won 9-0 at Meltis Albion. Tom Howson with a hat-trick led the way, David O’Brian added a brace and was joined on the scoresheet by single goals for Braydon Judge, Rob Kurzawa, Mitch Butler and Adam Worthington. Elsewhere Biggleswade FC Reserves are still looking for their first win after losing 4-2 at Cranfield United Reserves. Martin Holland with a hat-trick and a goal from Joe Sames marked the home scoresheet against replies via Ashley Boness and Ewan Smailes. Henlow won 2-0 at The 61 FC Luton Reserves thanks to a brace of goals from Matthew Sockalingum. There is no change at the head of Division Two following wins for the top five sides. For leaders Houghton Athletic it was a 2-0 away win at Elstow Abbey where Michail Tudos netted twice. For second place Renhold United Reserves it was an 8-4 victory at Westoning. Michael France scored a hat-trick, Gavin Cheema added a brace with single strikes from Tom Skinner, James Lovell and Hayden Shipp being replied to by home braces from Lewis Wilson and James Lovett. Both sides will be looking over their shoulders to find in third Henlow Reserves who, having played a game less, still remain 100% for the season following their 5-1 home victory over Sundon Park Rovers. James Campbell with a brace was joined on the scoresheet by Russell Ayles, Chris Powell and Marcin Bator to bring up the nap hand against a lone Rovers reply via Craig Davey. For fourth place Wilstead Reserves it was a 3-2 home win over Caldecote Reserves thanks to goals from Luke Pursey, Greg Turnball and Sean Harrod against a brace in reply from Adam Legate. Whilst the biggest win of the day went to fifth place CS Rovers with a 7-1 home win over bottom of the table Marston Shelton Rovers Reserves. Connor Darocha netted four times alongside single strikes from Lewi Saunders, Ultan Coonan and Daniel Gallagher against a lone reply from Rovers Dale Malciw. Now making up the top six are Atletico Europa who won 2-1 at Wixam Wanderers. Yasin Demir and Paddy Alimanji netting the goals against a home reply from Joe Holmes. Whilst for AFC Oakley M&DH Reserves it was a 1-0 home victory over Luton Leagrave AFC. Daniel Cullan netting the vital goal. The standings at the top of the Division Three table remain unaltered following wins for the top four sides. 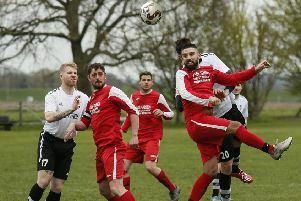 League leaders Harlington held onto top spot by the virtue of having scored a greater number of goals than second place Black Swan after they retained their 100% ways with a narrow 2-1 home win over Sandy Reserves. Shea Gentle-King scored both goals against a Sandy reply from Adam Grimshaw. Black Swan in second also remain 100% for the season after winning 5-3 at Shefford Town & Campton A. The points seemed as good as won in the opening 15 minutes after Shea Doran with a hat-trick slotted them 3-0 ahead including one from the penalty spot. However by the hour mark they had only added to their scoreline one more via Levi Yearwood against three home strikes in reply via a brace for John Vooght and a single goal from brother Bradley to leave the points still up for grabs at 4-3. However it was to be the Swan’s day when Patrick McCafferty put the game beyond the home side’s reach with a fifth goal 17 minutes from time to make it 5-3. Town then ended the game with just 10 players after goalkeeper Lewis Osborne was red carded just two minutes from time. In third spot and still unbeaten this term are Clifton who won 8-0 at bottom side Dinamo Flitwick. Dylan Donaldson with a hat-trick and Dale Houghton with a brace did the main damage and they were joined on the scoresheet by strikes from Jose Caries, Cameron Lewis and Adam Lawrence. Completing the sweep of top sides winning were fourth place Lidlington United Sports with a 6-0 home win over Wootton Village. Chris Roberts, Steve Didlick, Ben Stubley, Brendan Cunningham, Gary Dearman and John Webber all finding the back of the net. Elsewhere there was a first win for White Eagles who won 5-1 at Stevington Reserves. Jan Bucur with a hat-trick was joined on the scoresheet by Dawid Gorzelnik and Andrij Zjablilev to bring up the nap hand. Whilst the remaining two games were to finish all square. Flitwick Town A, with a brace from Dominic Collins against replies from Lee Leonard and Gary Whitbread, drew 2-2 at home against Kempston Athletic. AFC Kempston Town & Bedford College A, with two goals from Daniel Oseji and a strike from Arkadiusz Boruch, drew 3-3 at Harvey Close against hosts Caldecote A for whom Tom Dupuy, Tony Norman and James Whitmore netted.